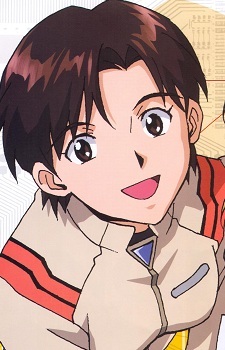 Maya Ibuki is a First Lieutenant at NERV and a computer technician who works primarily with Ritsuko Akagi. Her main role during the fights with the Angels is to constantly monitor the Eva pilots’ synchronization ratios and send various emergency commands to the Evangelions as ordered by Misato or Gendo. Her implementation scene during the The End of Evangelion movie has been read by many fans as a revelation that she is secretly in love with Ritsuko. When Maya's Instrumentality occurs, Lilith (in the form of Ritsuko) types "I need you" into Maya's laptop and embraces her. Maya's reversion to LCL comes after an ecstatic gasp of "Senpai!" However, this scene is the only one that alludes to her possible feelings towards Ritsuko, and its intention is not clear. In spite of her profession, Maya despises violence of any sort, and is frequently shown becoming nauseous and averting her eyes during battles with the Angels. Notably, in The End of Evangelion, Maya is the only NERV officer who is shown refusing to fight back against the JSSDF invaders. She rejects the gun Shigeru hands her to defend herself saying "I can't shoot this thing", not because she is unskilled, but because she has never shot it at a human being. Throughout much of the second half of End of Evangelion Maya is seen with her face buried in a pink pillow under her desk. She is sometimes described as representing the audience's views throughout the series, as she shows revulsion when it would be most likely for the viewer to do the same, and delight in other, more light-hearted scenes. Neon Genesis Evangelion tackles heavy topics such as human identity, ambition, desire, regret and self-worth. Characters in the series are deeply flawed and spend a lot of time reflecting on personal issues. As such, the show is a goldmine of quotes on the subject of what it means to be human.